Sharing my enthusiasm for live performance, here at home in Liverpool and elsewhere when I can, in the hope that it will encourage others to go and enjoy what I have seen. 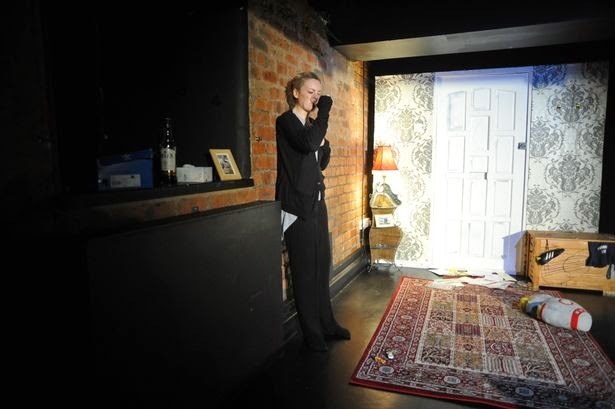 Trisha Duffy’s debut play has enjoyed two previous sell-out runs at the Lantern last year - so well attended, in fact, that I missed the boat on both occasions and was unable to get a seat, so I took the opportunity when it had a further revival this week. Two young men were posted to Afghanistan but only one returned, his life saved through the selfless bravery of his friend. Back home in Liverpool two mothers, who have been friends for years, battle with the emotional scars that have driven a wedge between them. One is consumed by grief, the other by guilt and compassion. Rita sits, paces and cries, slowly falling apart behind a locked door, a bottle of whisky in one hand and a bottle of pills in the other. Her neighbour Maggie perches on an upturned crate on her doorstep and tries to talk her into opening the door, but Rita’s emotions run so high that she can’t bring herself to face the friend who seems to represent the reason her son was lost. How can Maggie possibly know how she feels when her son came home safe? Leanne Martin and Gillian Hardie play the two innocent casualties of war in an hour during which they never come face-to-face, but spar with words and exchange cigarettes and memories through a letterbox. Both deliver powerful performances, negotiating the rollercoaster of emotional peaks and troughs with poignancy. The play would be a two-hander, were it not for the occasional appearances of Louise Garcia as Molly – a teenage neighbour who comes and goes from a noisy party across the street – and her interjections offer some of the opportunities for comedic relief from the tension that pepper the script. For all its dark despair there are a surprising number of laughs to be had in the dialogue, which is well written and falls naturally from the actors’ lips. Lantern Theatre A.D. Margaret Connell directs with care and maintains a tension that holds right through to the play’s tragic climax. Some of the offstage, recorded dialogue overheard from the party felt a little superfluous to me and I would have been happy without it, but this in no way detracted from a moving and thought provoking evening. Safe to say that debut writer Trisha Duffy has a distinctive voice that could be heard throughout the play.